Amidst the turmoil, three very different criminals plot their own chances of survival and success: Franklin, a former street gangster, now looking for real opportunities and serious money; Michael, a professional ex-con whose retirement is a lot less rosy than he hoped it would be; and Trevor, a violent maniac driven by the chance of a cheap high and the next big score. Running out of options, the crew risks everything in a series of daring and dangerous heists that could set them up for life. Rockstar could do with a stronger focus next time, but there's a ton of content to play around with in Grand Theft Auto V. If you can look past a few problematic things, the core of GTA V is still an amazingly fun game. Grand Theft Auto V is a testament to what ambitious game developers can do with an adequate amount of time and financial resources. As it is, it’s also a testament to the value of single player experiences. 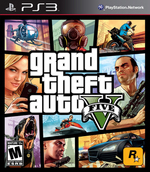 Even without GTA Online at launch, Rockstar Games’ value proposition in GTA V is one that many games can’t match. There’s just so much content in this game that it’s bursting from the seams with things to explore and try. Rockstar Games deserves credit for pushing the boundaries of its flagship franchise yet again with improved controls, great mission variety, and the most jam-packed open world I've ever visited. The narrative fails to match the impact of John Marston or Niko Bellic's tales, but the colorful characters kept me interested in the story nonetheless. Like the golden state it parodies, Grand Theft Auto V is filled with beautiful scenery, a wealth of activities, and the promise of fortune. GTA V is an imperfect yet astounding game that has great characters and an innovative and exciting narrative structure, even if the story it uses that structure to tell is hobbled at times by inconsistent character behavior, muddled political messages and rampant misogyny. It also raises the bar for open-world mission design in a big way and has one of the most beautiful, lively, diverse and stimulating worlds ever seen in a game. So, it's GTA 5 (again), but better (again). 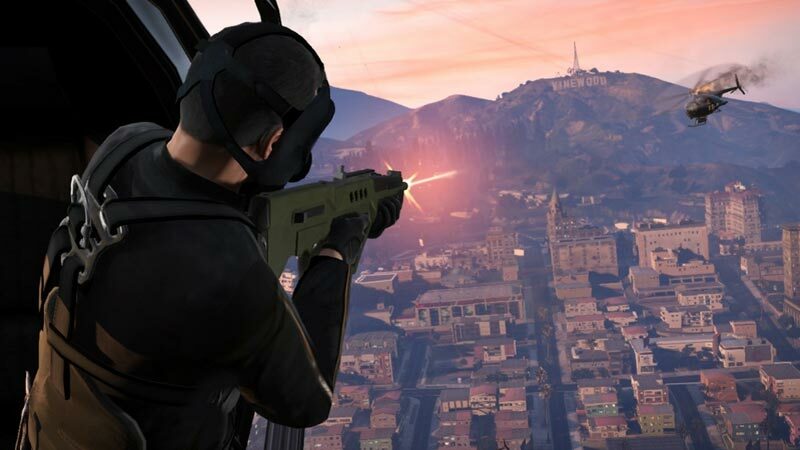 Throw in out-of-the-box Heist support as part of a stable version of GTA Online and you've got the complete version of the game, and one that - despite its aesthetic and technical achievements - isn't actually that demanding to run. Rockstar has expanded and improved upon so much of what's special about video games as mainstream spectacles, from the playful use of characters to the refined take on world design. The developer's progress makes the aspects of the game left in cultural stasis the poorly drawn women, the empty cynicism, the unnecessarily excessive cruelty especially agitating. 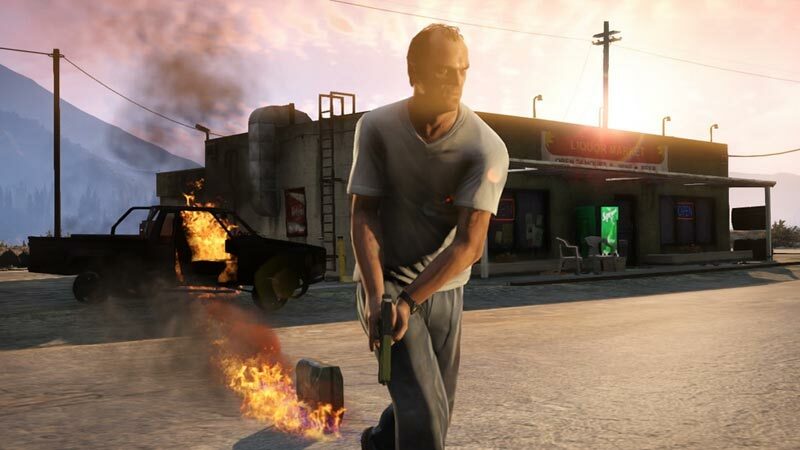 Grand Theft Auto V is a remarkable achievement. Fun, challenging, satisfying and morally complex, it’s also proof of the ability of games to tackle mature subjects while still being enjoyable diversions, all in service to great characters and a gritty story. No, it’s not a revolution by any step – it’s more the stable government established once the revolution is over. It perhaps relies too heavily on successes from the series’ past. Grand Theft Auto 5 is an ambitious game, attempting to meld three very different characters together to tell one encompassing story of survival in what amounts to the worst place in America. That story stumbles, but the open-ended gameplay remains a showpiece for the vast amount of content that can be poured into a virtual world. Its over thought systems can get in the way on occasion, but the adventure's issues are never prominent enough to detract from its scathing commentary on modern life. Rockstar's latest tale of crime and punishment is easily one of the best open world games on the market – and it represents the pinnacle of the publisher's massively popular property, too. This is a considerably different style of game than either San Andreas or Vice City, with more structure and less of that eyes-wide-open world where the most fun was surveying the landscape and seeing what kind of trouble you could get into. This is a new GTA, one that is a great game on its own terms, but also one that fails to capture the magic of the freestyle adventures that set the tone for the series. GTA V was a great game last year. Now it’s more than just a great game, it’s damn near perfect, and I don’t say that about many games. The attention to detail Rockstar has put into this new version is above and beyond what we are used to getting and set a new bar for all other developers out there wanting to re-release a great title on next-gen platforms. If you’ve never played (hell even if you have) GTA V, now’s the time to experience all the greatness Rockstar has put into this version. They say it's the most expensive game ever made, and you can see every Los Santos dollar up there on screen. This is a huge game, a beautiful game. Your jaw will drop as far in the twentieth hour as it did the second at what you see. You'll laugh with these guys at their jokes, and get their predicaments - the cast is well-written, and well-acted. This is also the slickest, easiest GTA game Rockstar has ever made, full of fine detailing that smoothes your experience moment to moment, like proper checkpointing and gentler law enforcement. ...GTA 5 may not be the Hollywood-beating crime story it wants to be, then, but it's the best video game it's ever been, and I'll take that. Rockstar ha sido uno de los grandes triunfadores de la actual generación, y han vuelto a demostrar el por qué con el inabarcable GTA V. Hacer justicia con un análisis a todo lo que ofrece es imposible, y sencillamente calificamos de imprescindible su compra a cualquier usuario amante de las experiencias adultas de calidad. Cuando se recomienda a ciegas a alguien la compra de un videojuego a menudo es una maniobra arriesgada, pero con un producto de la calidad del que nos ocupa equivocarse parece poco menos que imposible. Dieses Spiel vereint den Größenwahn einer an Möglichkeiten überbordenden, detailversessenen Welt mit ausgereiften Kontrolle für Kampf und Straße. Bekannte Längen tauschte man wohltuenderweise gegen eine durchgehend treibende Handlung, die alles nicht nur zusammenhält, sondern sogar ein klein wenig größer werden lässt, als die Summe ihrer Teile. Nur 'ein klein wenig', weil die Summe dieser Teile hier schon eine ganz schön große Zahl ergibt. Rockstar hat es wieder einmal geschafft: Grand Theft Auto 5 ist ein actionlastiger Themenpark, wie es ihn als Open-World-Spiel bislang noch nicht gab. Die Kulisse führt die Konsolen zwar an ihre Grenzen und zeigt immer wieder Probleme mit Kanten, stabiler Bildrate oder kleinen Bugs, doch wenn es darauf ankommt, passt alles. Das Ergebnis ist eine lebendige Stadt mit teilweise Atem beraubenden Landschaften, deren Geschichtchen die Glitzer- und Glamour-Welt Hollywoods ebenso bitterböse und unterhaltsam karikiert wie den amerikanischen Way of Life. 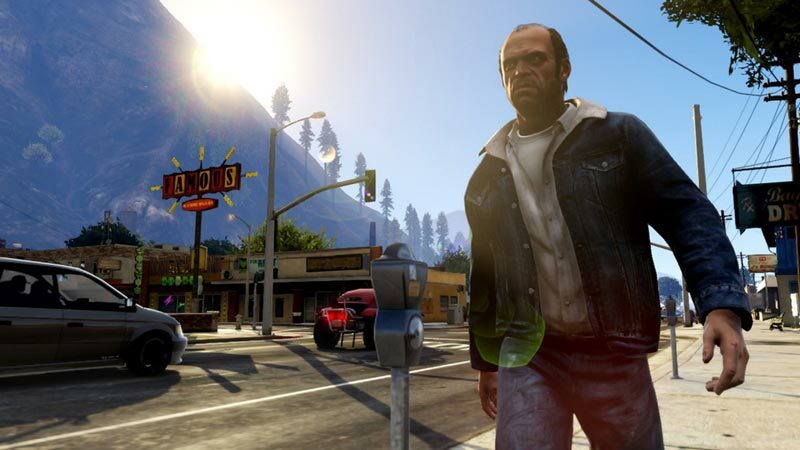 Malgré son scénario un peu prévisible et ses fins un chouia expédiées, GTA V est magistralement mis en scène et jouit d'une narration aux petits oignons, bien aidée par le switch permanent entre Michael, Trevor et Franklin. Le sentiment de liberté poussé à son paroxysme. Quant au multijoueur, GTA Online offre une réelle prolongation de l'expérience solo et crée un nouveau genre soumis à évolution. Le résultat est satisfaisant, offre un vrai confort de jeu en équipe ou en solo, et du contenu en pagaille ! Rockstar a d’ailleurs fait les choses bien en intégrant de nombreux checkpoints automatiques dans les missions, pour ne pas avoir à tout se farcir à nouveau. Et pour ceux qui galèrent trop, il est même possible de zapper certaines séquences trop hard et ainsi continuer l’aventure sans jamais rester bloqué. L’évolution des mentalités les amis. 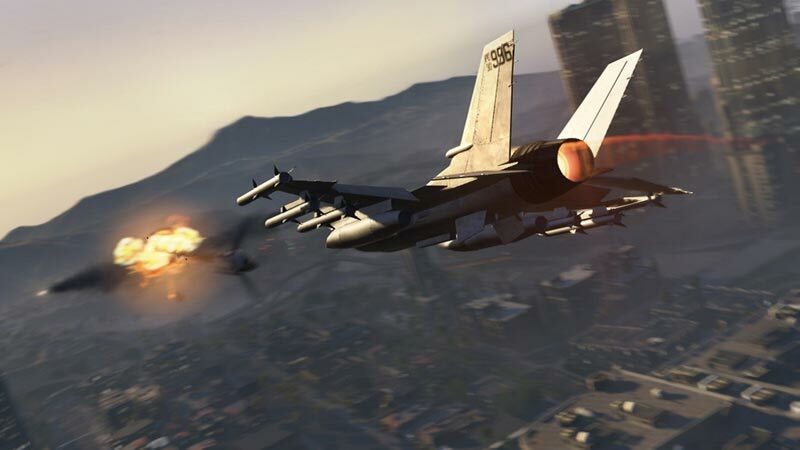 Cette réussite exemplaire, GTA la doit à une ambiance incroyablement réfléchie, dans la lignée de San Andreas, à un gameplay toujours plus riche, pour mettre en place des missions d'une envergure exceptionnelle, et à une technique vraiment limpide pour un jeu du genre, sans doute la plus belle surprise venant de Rockstar. L'attente a été longue, les espoirs placés en lui peut-être démesurés, et il reste toujours quelques détails à peaufiner, notamment la visée. Mais GTA 5 a réussi son pari. 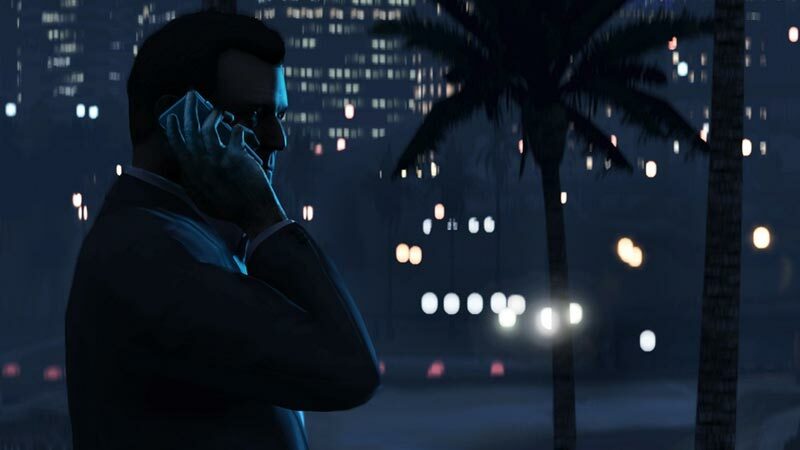 Tidak mengherankan Grand Theft Auto V menjadi salah satu game paling ramai dibicarakan tahun lalu, karena game ini merupakan sebuah game yang amat sangat ambisius. Mulai dari cerita yang keren, sistem tiga karakter utama yang sangat bagus baik dilihat dari segi gameplay maupun dari segi naratif, serta dunia yang sangat menarik untuk dijelajahi.